#HostHoldingAQuestionCard… for a format without questions? More of a prompt card, I suspect, but the incongruity makes it funny. The best #hostholdingaquestioncards are ones from shows with no quiz element at all. Also quizzes that don’t use them. Today’s Jeopardy! is worth watching…. 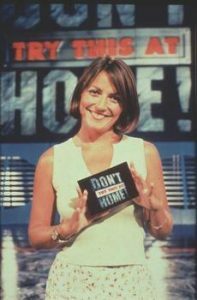 May as well point out when I first came across Davina: it was around 1996, when I was eight and living in Ealing, and Carlton launched their early-evening entertainment guide Good Stuff, which she co-presented with, um, Rowland Rivron. (Would certainly be an unusual pairing today; probably wasn’t considered unusual at all at the time.) Me and my parents only had the terrestrial channels, so it wasn’t until a few years later that I learned of her humble beginnings on MTV. DTTAH! was, of course, her first big show (although it’s fairly easy to overlook the fact that Darren Day co-presented the first series; another pairing that would be more unusual today than it was then). I watched it rather a lot, as much for the challenges as for Davina – and it was always great fun when she tried the Challenge of a Lifetime for herself after the MOTP backed out, even if she tended not to succeed at it. I liked the theme tune, too, and still do today (even if it *is* by Simon May of EastEnders infamy). Twenty years later, DTTAH! obviously isn’t the show Davina’s best known for (nor is it as fondly remembered as You Bet! ), but IMO it remains one of her very best. The theme tune is great but boy does that sting start to wear a bit thin after playing it at about 100 points through the episode! 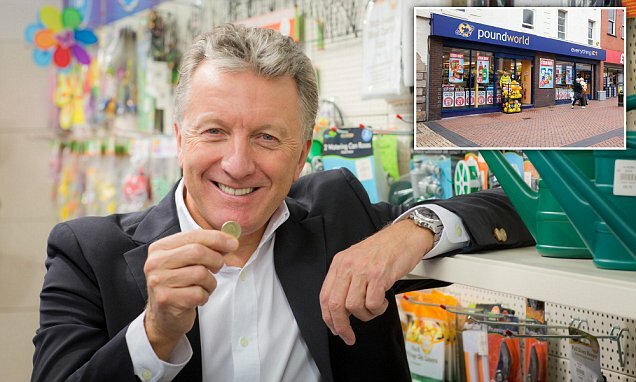 It must have cost ITV a small fortune (go away Dermot) in production costs, insurance – especially with Davina having a go, health and safety, experts – then on the flip side you had Paul Hendy turning up at the local shopping centre for his ‘challenges’…marvellous! I don’t remember that Paul Hendy bit being so rubbish! Have to give a shout out to the set for this one – there really aren’t enough HUGE extractor fans in today’s shows! Also is that John Sachs doing the VO at the start? No, Russ Williams of “what is Russ Willimas up to these days?” fame. Did a lot of v/o work around the same time, Under Pressure et al.